"Synesthesia is an involuntary joining in which the real information of one sense is accompanied by a perception in another sense." -R. Cytowic, "Synesthesia: A Union of the Senses"
Synesthesia is one of the most fascinating topics in popular neuroscience. Read more here, and listen to this great Radiolab episode for further exploration of the subject. 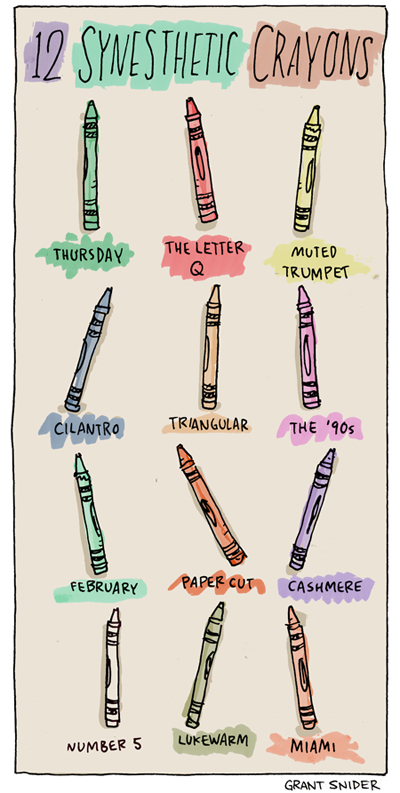 As a kid, I remember associating the days of the week with certain colors, and I pictured months, years, and decades in a sort of mental map. My highly unscientific speculation is that most people experience some form of mild synesthesia. This drawing was a self-rejected sketch for an upcoming submission. Exciting things are happening for Incidental Comics - keep reading in the next few months for details! Oh god I love this! I read a book some months ago called The Hidden Sense: Synesthesia in Art and Science from Leonardo Book. It's a great book to enter the world of synesthesia and understand a little bit mroe than the basics. Great blog, I'm a big fan of Incidental Comics. I used to think the letter Q was green because of the opening credits to Quincy, M.E.. I was just learning my alphabet back in the early 80's when the show used to come on. I think the rest of my color & letter/number associations come from those plastic magnet letters and numbers with the magnets on the back. I don't know if I can call myself an artist by designing outdoor signs but I can really relate to your witty and uncanny humor. Your art makes my day! The most effective way in producing a good ads is to know how and what are the colors to mix. And how catchy it'll be look like, just like the drawing we got here, it's simple yet the message is just so catchy. I think ASMR may be related as well. Oh Might as well... http://www.asmrstudio.com has great ASMR if that is of interest with the synestheses.